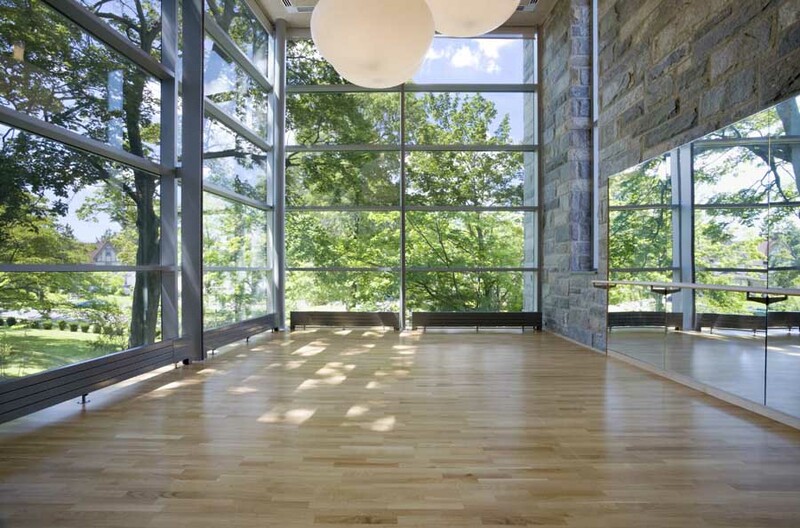 The Center for Wellness at the College of New Rochelle, in New Rochelle, New York, is a paradisiacal garden for the exultation of the body, mind and spirit. Like narrative and pictorial depictions of the Garden of Eden, the Center is a sheltered meditative precinct removed from the urban distractions of metropolitan New York that surround it. 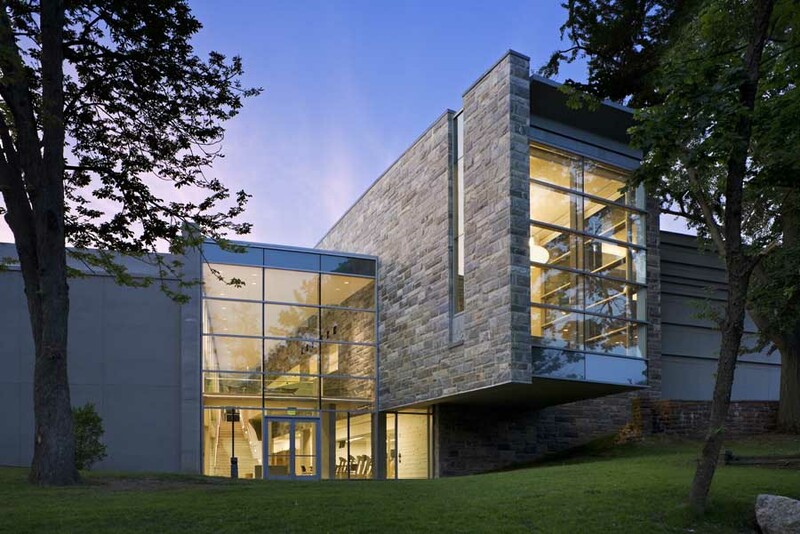 Deftly combining local granite, concrete, colored glass panels and land, the Center merges the relationship between building and landscape and achieves a LEED certification through a thoughtful approach to materials and systems. Metaphorically, each of the major program components represent a landform; the natatorium is the grotto; the gymnasium is a rock outcropping and the multi-story lobby concourse is a stone crevasse deeply cut into the gently sloping site. Vaulting exposed concrete ceiling and walls, in the natatorium, convey the imagery of a grotto nestled within the slope of the site. Skylights set above in the sinuous concrete cavern allow natural day lighting to penetrate to the cool waters below and reduce artificial lighting and energy consumption. A heat recovery heating ventilation and cooling system in the natatorium utilizes escaping energy from the tempered competition pool waters. Externally, a roof garden, over the natatorium provides a green landscaped place for contemplation and reflection while reducing heat emission and impervious water run off. 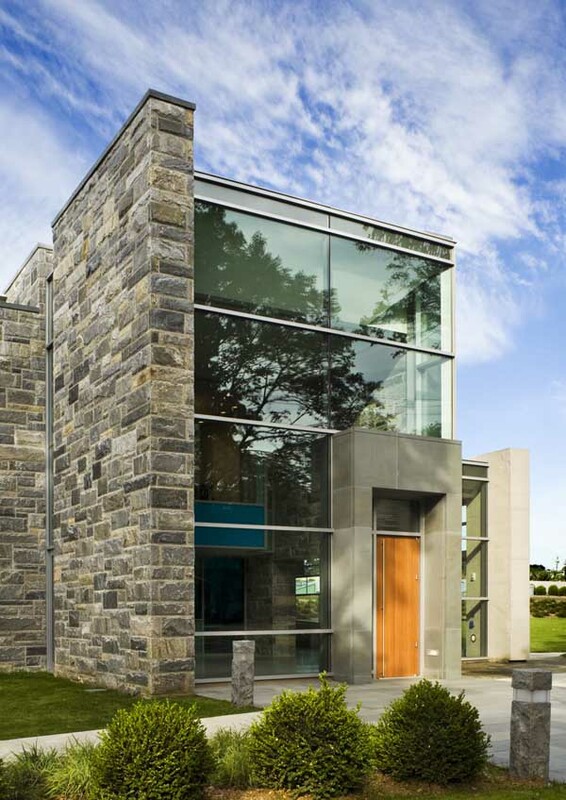 Curving exterior stone walls of the gymnasium emerge from the adjacent lawn as tectonic outcroppings. One portion cantilevers over the sloping site like a rock ledge suspending the holistic mediation room among a grove of mature trees. 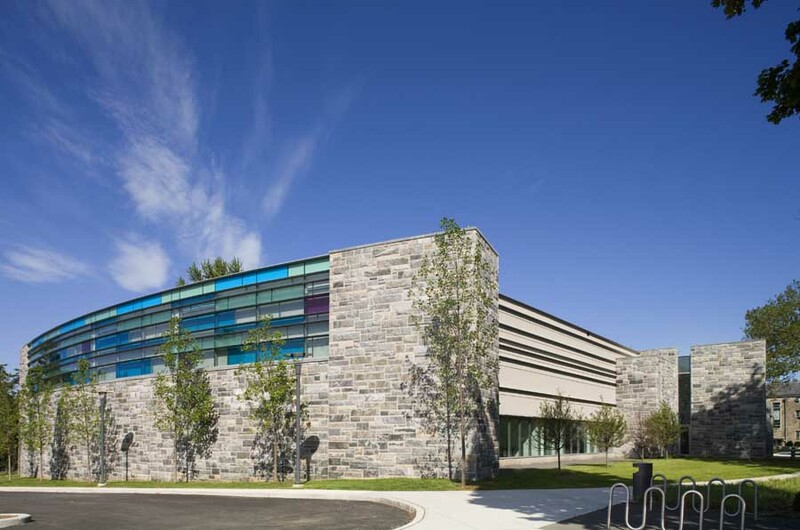 Windows are carved out of the stone walls, like fissures in the stone surface and variegated colored glass recall the stereo metric pattern of the adjacent stone and assist in shading day sun glare in to the gymnasium. Internally the walls of the concourse lobby are made of rough hewn granite and sandblasted concrete. These two walls inflect spatially creating a crevasse like environment and reinforcing the merging of landscape and building. From the entry level a grand concrete stair flows to the lower level. 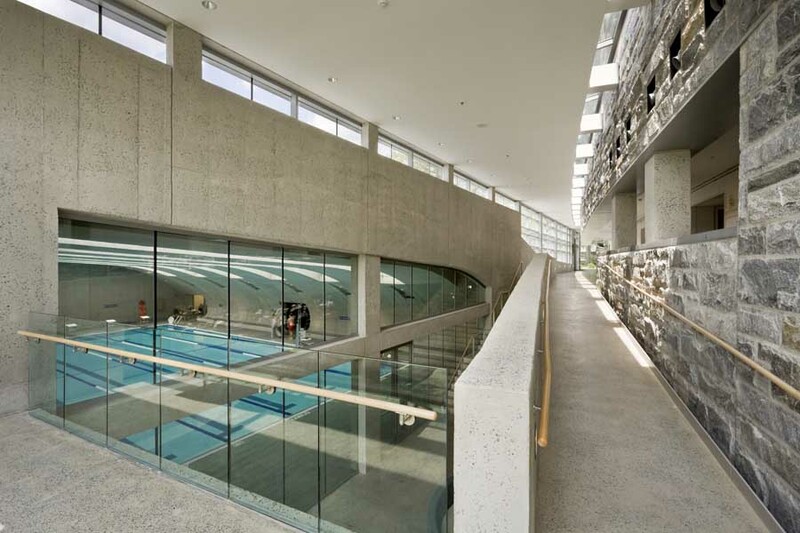 Interior recyclable materials, such as glass chips in the ground concrete flooring of the lobby and cork and rubber athletic flooring of the fitness center provide sustainable approaches to interior materials that also reinforce the metaphoric ideology behind the facility. 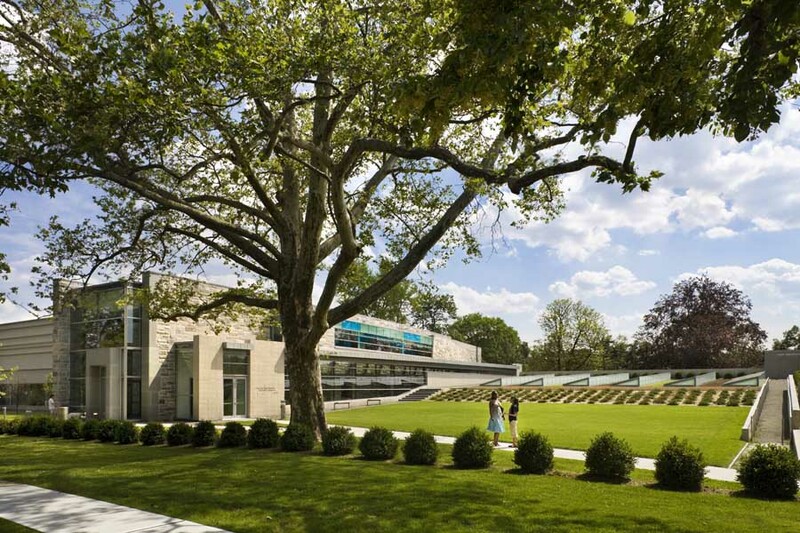 The Center for Wellness at the College of New Rochelle utilizes sustainable systems to reinforce the thematic design ideas of the project that is, to create a Center for Wellness as a paradisiacal garden for the rejuvenation of the body, mind and spirit. In creating the grotto/natatorium; the rock outcropping/ gymnasium or the crevasse/concourse; sustainable approaches such as; reduced artificial lighting, roof garden, local quarried and recyclable materials are used to express the metaphors of the landscape of Eden.